It’s that time of year when Pacific Art Glass has it’s winter shindig…The Spirit of 96. Patty Gray is in town teaching with her ladies and Ryan Staub is in doing roll up. 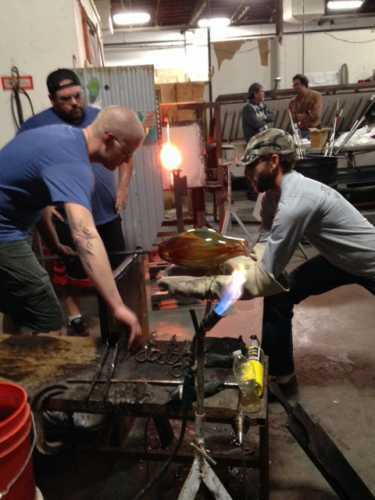 Fabulous glass blowing! We were able to watch Ryan do two kinds of roll ups from flat fused glass. The most fabulous was watching him transform a disk into a vase. Since I have glass blowing on the brain right now, watching this show was super cool. Another highlight of the evening is the raffle and auction to raise money for Foster kids. Some of the items raffled off were quarter sheets of Pacific Art Glass own dichroic glass. They now have chambers and are making their own and after testing it I can say it is some of the strongest coating I’ve used. The purples and pinks are gorgeous! Love dichro!